Our hearts sank as we stared at the huge green door that was locked. Those dimensions meant that we could not even try to peep over the doorway. And as per regular schedules, the temple would not be opened for at least 4 more hours. Though a bit unsure about disturbing him (the priest; not Mani Sir), we had no other choice. So we knocked on his door. 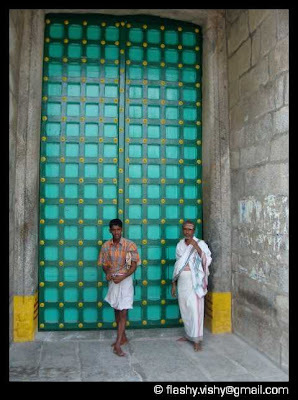 After we sheepishly told him that we wanted to visit the temple, he came out at once to open the door. He did not betray even a wee bit of irritation at being disturbed, though he had locked the temple just ten minutes back. And his wife was extremely hospitable and offered us water (while we were expecting her to abuse us for disturbing her husband’s siesta). Mr Sambu (the priest) unlocked a small part of the huge door and went in, asking us to follow him. My cousin did that without batting an eyelid, while I had to battle with the door-lid to squeeze myself in. Mr Sambu (right) and his assistant. It was now that I began to actually observe the temple. It was not Herculean as I had imagined it would be, but it sure was huge by normal standards. But I was very disappointed at one thing: everything looked fairly NEW! And I had traveled a distance expecting to ogle at an ancient relic! The priest clarified things when he said that the temple was rejuvenated in 2002. That was a setback right at the beginning for me. But I labored on into the sanctum sanctorum. The priest then began to narrate the “thala varalaaru” (meaning “the story of the making of Shiva-ji’s temple”.. Not “Thalai Ajith’s Godfather-turned-varalaaru”). Long long ago, there was a King by name something. He had some minor tiff with a sage named something else and wanted to blast him into after-life with the kind of pyrotechnics we see on TV. But since the sage was actually much more powerful (and also since Standard fireworks had not been established by then), the King could not inflict any harm on the sage. So he worshipped Lord Vishnu to help him in this. The Lord responded by setting his Chakraayudha (cycle-pedal-ring-like wheel weapon) upon the sage. The sage did die, but the Chakraayudha got destroyed as well. So the Lord’s idea of using the boomerang-like weapon boomeranged on him and he was left wheel-weaponless. After a while, another war happened during which the Lord missed his weapon a lot. In order to get another tool of the kind, He came to the spot where we stood and worshipped Lord Shiva asking for a new weapon. After 3 yugas (9000 years), Lord Shiva appeared in front of Lord Vishnu and said “Un thavatthai kandu mecchinom” (meaning “Am pleased with your penance”). Meanwhile, Lord Vishnu had had this habit of offering 1000 lotus flowers everyday to Lord Shiva, but as Murphy would concur, on exactly that day, he had one lotus less. Since there was not enough time to get one from Koyambedu market, Lord Vishnu offered an eye of his own instead. Lord Shiva was mighty pleased and granted Lord Vishnu with a new wheel weapon: the mighty Sudharsana Chakra (which has been used ever since to slay demons at daytime, and mosquitoes at nights). And it is for this reason that Thirumalpur is also known as Hari-chakra-puram (without the hyphens). Thanks for your compliments.. And am not worried abt religious zealots da.. Only close friends of mine visit my blog.. and that also only to appease me :) he he.. It is not a good to make such cheap comments about our own gods. May be you think it is fun. Let the almighty holding that sacred Sudharsana Chakra forgive you. My apologies if my light hearted comments offended you.. I just wanted to make it light reading for me readers.. I was personally very fascinated by the story, but had to make it reach people who read this.. Hence the perceived irreverence..
My way of looking at it is - God is our own.. Like any of my family members or friends... Can I not take liberties with someone whom I consider my own? I feel I can. That's my stance on this. Thanks for your frank and well-worded feedback though! i am a very religious person who loves to visit differnt temples and because of that i read your blog.hats of to you.your review was enjoyable to read.i was recovering from dental surgery and your review helped me recover better. Thank you for dropping by my blog, and thanks for the comment too! If you like visiting temples, you SHOULD visit Thirumalpur.. It's not old any more, but the route and the peace/calm at the temple is more than enough to make one very happy!